Crewe Alexandra's on-loan defender Semi Ajayi says their self-belief will be the key to any successful fight against relegation to League Two. The Alex currently prop up the rest of League One and are six points adrift of safety with 22 games remaining. "Confidence is massive," 22-year-old Ajayi, who is on loan from Cardiff City, told BBC Radio Stoke. "It's key - you just try not to get nervous and once the team gets confidence, we'll start flying." Crewe's last win was back on 28 November and they have picked up just one point from their last four games. By the time they go to Swindon on Saturday, it will two weeks since the Railwaymen's last match - a 5-0 defeat by Coventry City. 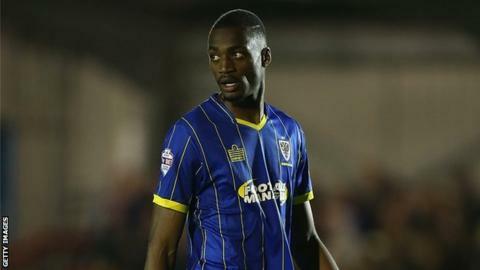 "It's definitely a relegation battle, we need to get out of this dogfight," Ajayi, who had a month-long loan at AFC Wimbledon in September, said. "We have to roll our sleeves up and get out of it - everyone wants to put that last defeat behind them and I think we'll have a really good reaction." Having arrived in November, Ajayi has extended his spell at Gresty Road until 26 February - the maximum time allowed under the 93-day emergency loan deal - and is hoping his remaining games will be influential. "Our results haven't matched our performances, but we've had lapses of concentration that have cost us," he said. "The style of play here suits me and extending my loan was always something I wanted to do - I want to help the team as much as I can."